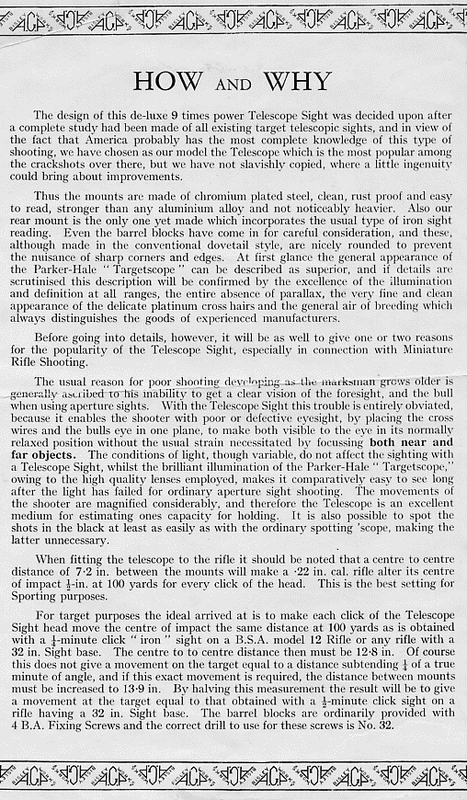 "Personally, I have little doubt that in a few years' time telescopic sights will have taken the place of aperture sights on TARGET RIFLES as a standard fitting, and everyone will wonder why on earth we did not adopt them years ago.The lead will come from the older shots - for to the man with failing eyesight the 'scope sight is the greatest boon ever invented." 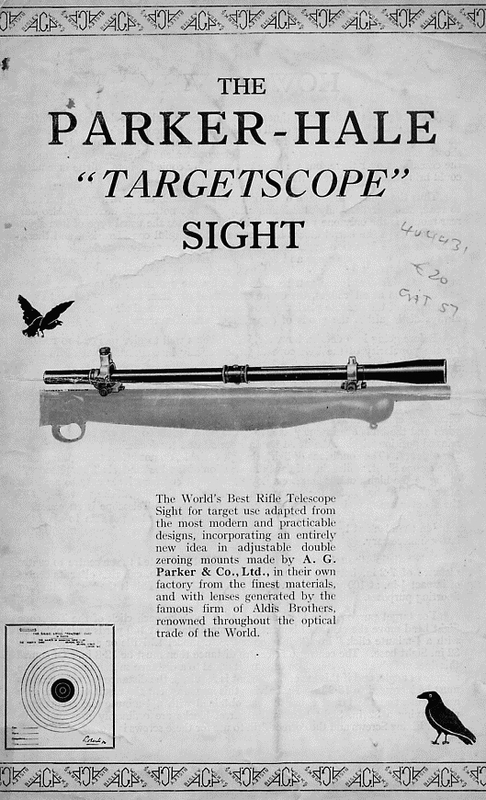 Banks went on to detail the prime telescopic sight on offer in 1938 - the Parker-Hale TARGETS cope and illustrated a rather " Heath Robinson", but nonetheless inventive, way of mounting the 'scope to a Greener Model 52 Martini actioned target rifle and utilising a Parker-Hale No.7 type rear aperture sight to permit accurate and easy adjustment for windage and elevation. money necessary to secure one of these high or super-class sets, and people who are searching for something cheaper but still capable of giving the highest class results, not obtainable with the cheapest American sets, may be interested to hear of my latest development." Much of the cost of a " TARGETS cope " of course goes into the back mount, which is accurately and solidly made to give quarter-minute click adjustments. 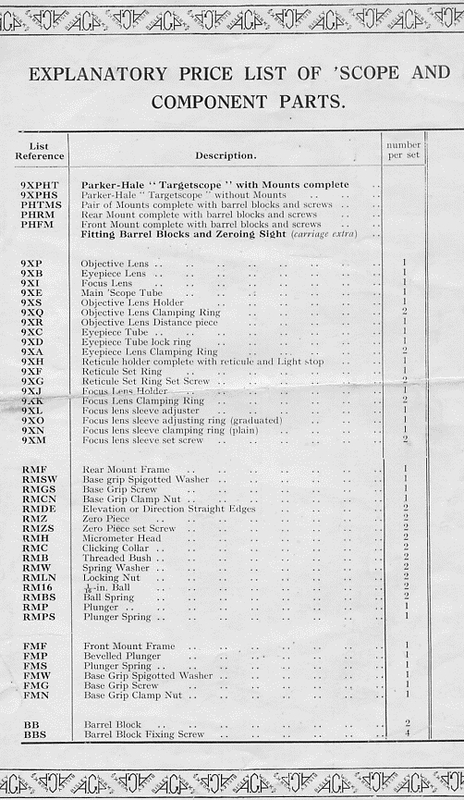 But every modem target rifle is already equipped with an equally well-made aperture back-sight giving the same thing ;'and if you can harness the back of your 'scope to this aperture sight and make it do the clicking for you, the necessity for a special back mount is obviated. This I have done, and I now proceed to give you a description of the method. and bring strain to bear on the back- sight. This would in time result in looseness and get you into hot water with the makers when you sent the sight back and blamed them , for it! It was the problem of designing an attachment which, while giving sure movement to the 'scope from the clicks, would allow this necessary flexibility, which, gave me sleepless nights. 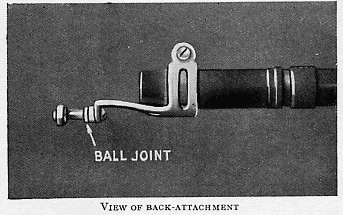 However, the solution is simple, and consists in effect of a ball-joint. You take out your eyecup, which screws into a hole about 1/4-inch diameter in the eye-cup block. Through this hole now goes a horizontal bolt fixed to the back of the attachment, and much smaller in diameter than the hole (5/32 in.). At the head of the bolt is a small spherical-faced washer, slightly larger than the hole. The bolt is secured at the back of the sight-block by a spring washer and nut, finger-tight. Thus the ball-face bears on the metal of the block at the edge of the hole, and forms a ball-joint, while the spring washer allows the bolt to move around a little in the hole as the adjustments are made. The illustrations herewith will make clear the general arrangement, and, incidentally, reveal to any old cyclists among you that the materials I used were, a certain old-fashioned type of cycle lamp-bracket and a couple of small cycle-bolts! You also require, of course, a certain skill in the art of using a file, if you are going to make your own ball-washer! I anticipated criticisms to the effect that this was a wobbly sort of arrangement and that it would not stay put. In fact, I admit to some misgivings on the point myself, before I tried it. The proof of the pudding is in the eating ; and the actual facts are that the 'scope is held with amazing rigidity and that it stands up to continuous shooting and answers the helm perfectly. 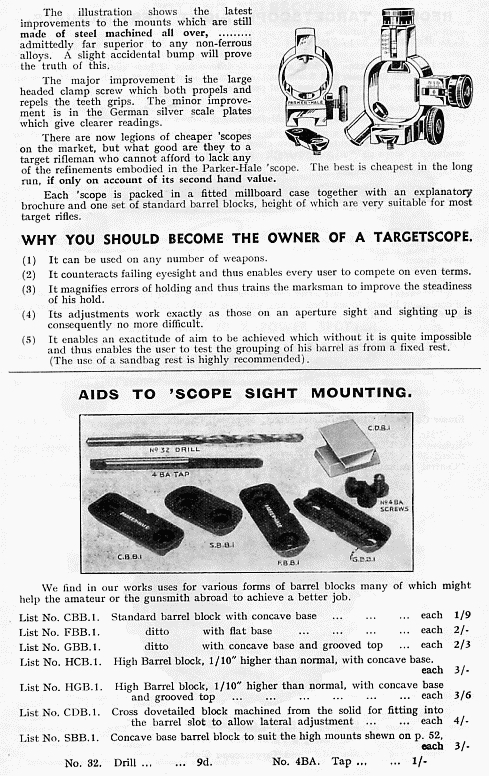 As no rifleman in his senses is going to make a practice of knocking any 'scope sight about or even risk leaning his rifle on it, the strength afforded is ample for all requirements. Also, you can take the 'scope off the gun and replace it with the certainty of its keeping the same zero. removed completely from the rifle and. refixed after each bull— five times, and, incidentally, dropped once! I can assure you that doing this on the firing point, in the prone position, and getting in and out of the sling, is shooting under difficulties and is hard work, so I must be excused for not producing a '' possible " ; for I found one such target quite enough. So much of "A.G's." comment is still valid today, and his following remarks on the subject of shooting with a telescopic sight are largely now as relevant as they ever were. "The first thing one finds, upon using a 'scope sight, is that, whereas one used to think that one could hold " rock steady," the rifle now appears to dither about as though possessed, even when using the relaxed hold. It is a matter almost of impossibility to hold the cross hairs steady on the centre of the bull for X more than a moment, and so one realises why in the past so many shots which one thought would be central bulls actually turned out to be clipping bulls or even nines. 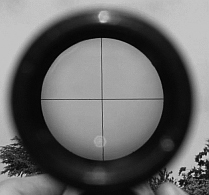 The danger in 'scope sight shooting is of concentrating so much upon the aim that the niceties of hold and trigger release, which I have dealt with in recent articles, are neglected. 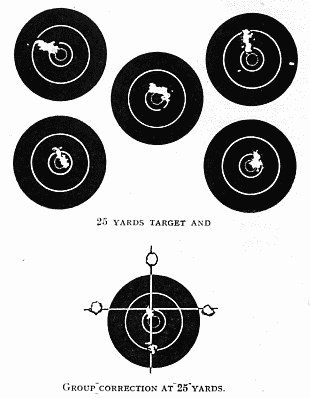 It is very fascinating to watch the shot hit the target, when it appears in the spot where one is looking for it. When it does not, it is not so fascinating! 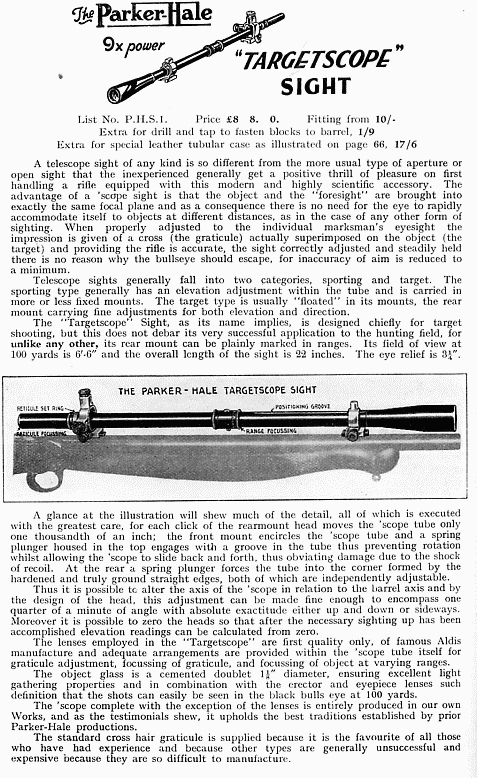 Using a telescopic sight, there is no doubt whatever when the aim is perfect, and it drives home to one the fact that real shooting depends chiefly upon regular holding ; for when a perfectly aimed shot falls elsewhere than in the centre, given first-class tools, there is no question at all that the holding or trigger release is at fault. 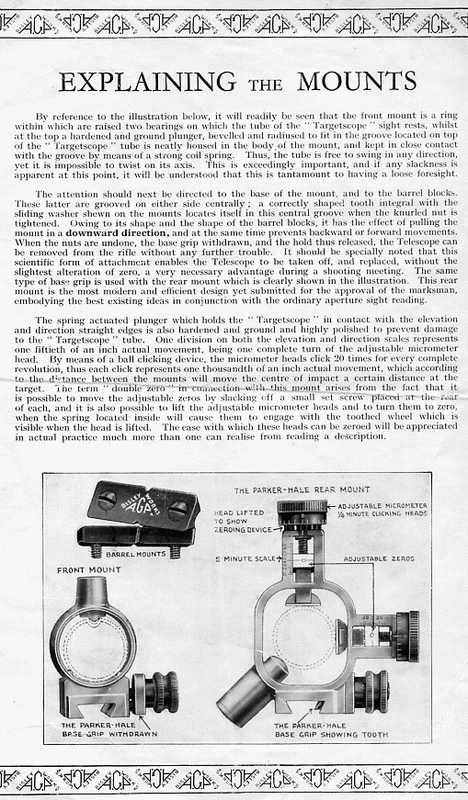 Nothing could popularise the genuine telescopic sight more than the general trial of this experiment which I have carried out and described, and when a real demand arises, manufacture in large quantities will ensure a much reduced price. " 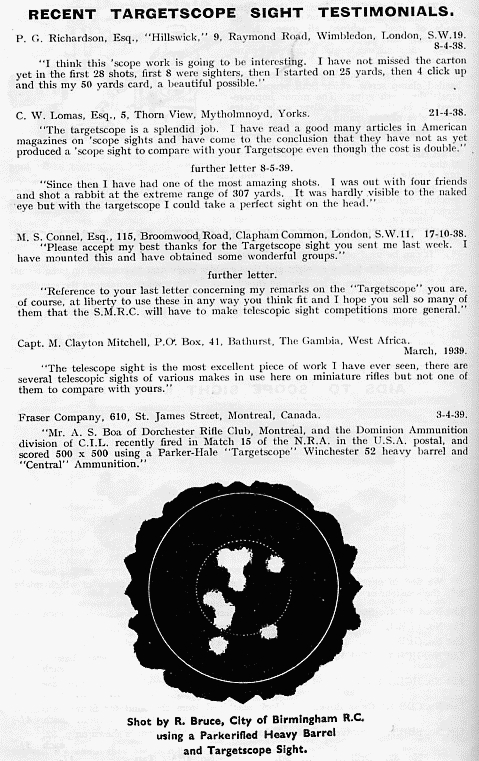 "A.G." did not mention that the use of a telescope for practice can provide the very best indication of one's faults with hold, breathing, aiming and let-off. Suddenly all the errors, previously unseen and unknown whilst shooting over or through iron sights, are magnified, visible and, most importantly, correctable. 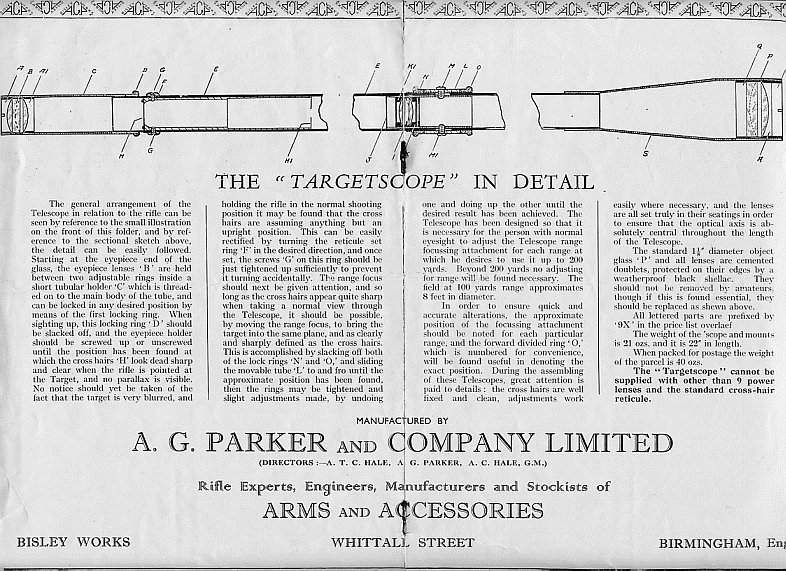 We now copy the very comprehensive Parker-Hale brochure for their 'scope. It is best shown in pictorial format and will surely have loaded on broadband by the time you read down to here! 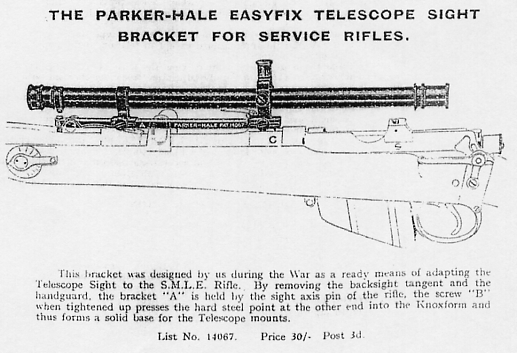 To close, in order not to offend or mislead any North American readers, we should mention that we are aware that these scopes were manufactured by Fecker of Cleveland and imported by Parker-Hale for sale in Great Britain under their own name. A considerable recommendation we would have thought.